In the interest of full disclosure I purchased and detailed three Foxhole Terrain 28mm ships long before I offered to do this review. I used them in a game at HMGS South’s annual Hurricon convention in Orlando and was complimented on the converted variants, so I offered to write up my opinion on the casting and the conversion process. The boats as provided are well done. 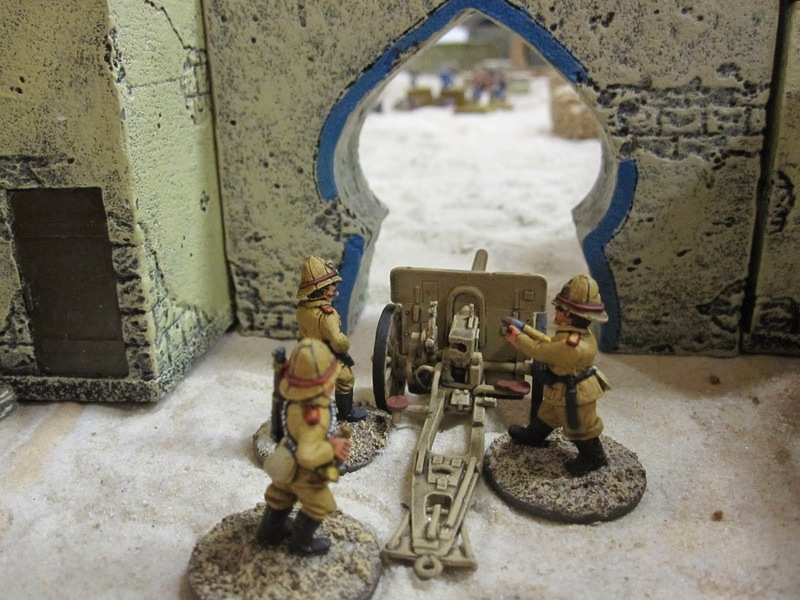 They represent what is needed in war-gaming models as opposed to collectible vessels, namely space and durability without compromising too much detail. 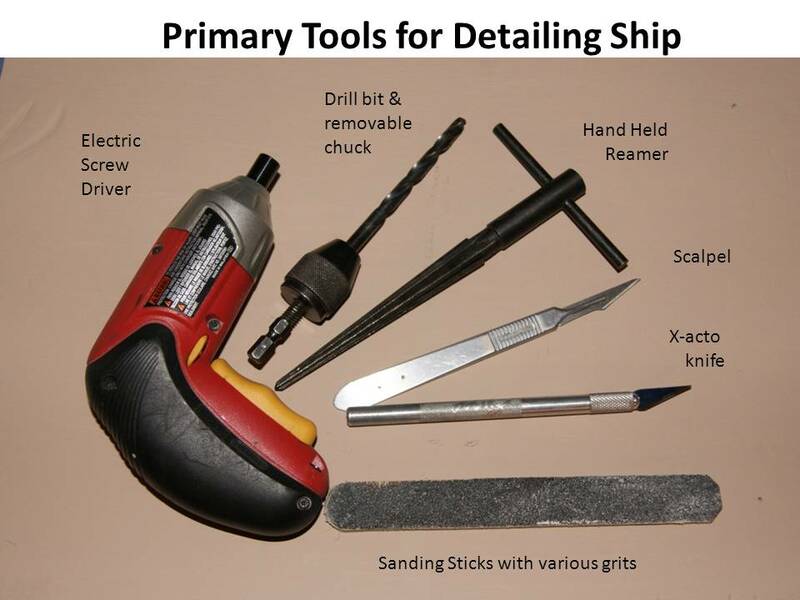 My ships arrived without air bubbles and required minimal sanding for leveling or flash removal. 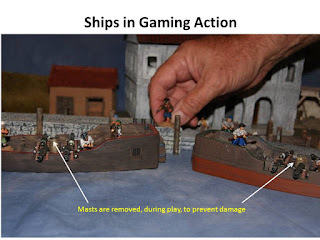 The goal of this review is to give the gamer a workable model, doable within most gamers skill levels with results that add visual appeal to the game table. 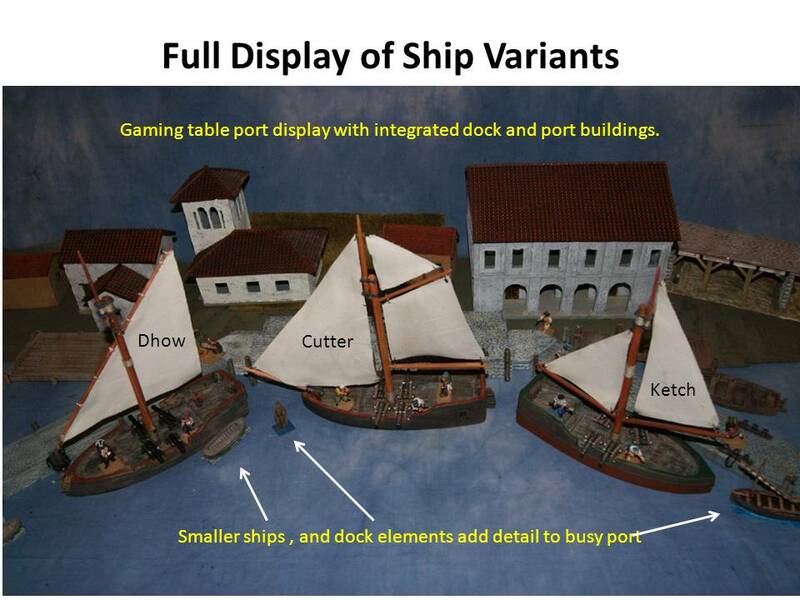 Figure one demonstrates the basic additions required to take the ship onto the table. Although a dowel is supplied with the kit, my need to super detail and provide some visual variety took over . I constructed three distinct variants by changing the sail design and surface details of each ship. To keep the text to a minimum I have provided illustrations of most of the techniques. Most of the detailing components are available within your budget. Ultra small fishing tackle is available at Wal-Mart, Balsa is available at the hobby shop, only small amounts are required. Wood dowels are everywhere from yard signs, Home Depot or the hobby shop. You may need to go on line to ship kit manufacturers for intricate parts such as the Ship’s wheel although I used some figures with casted on steering wheels. The lead foil is stripped from the necks of wine bottles although good foil is getting hard to come by. The tools and materials I used are probably available to the average modeler or war gamer. The Electric screwdriver is a must and preferred for most tasks because it has a higher torque and slower speed than a power drill. You may need to obtain the hand held reamer from a specialty shop however the other tools are fairly common. When using the scalpel and hobby knife have extra blades. An Old Modelers tip says, “The sharper the better”, when cutting sail cloth. 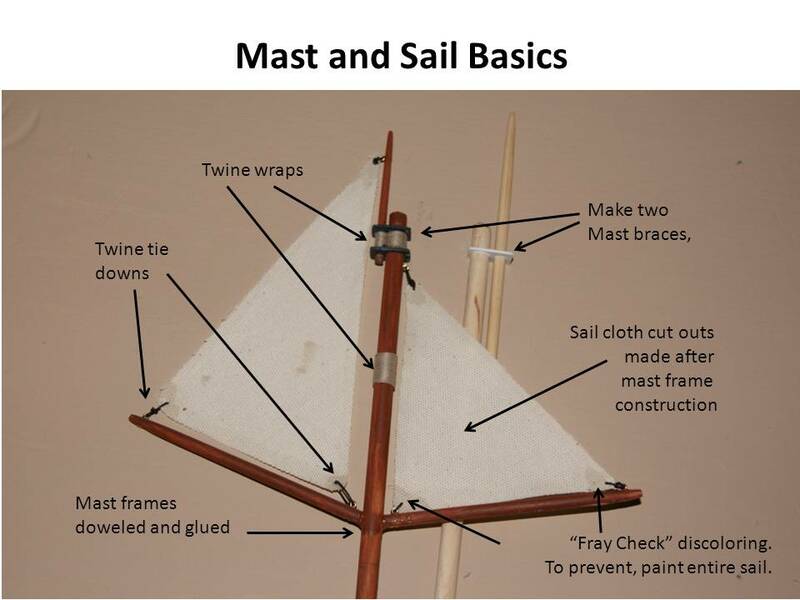 Fabricating the masts and sails may take a trip to the fabric shop. The most essential material is the fabric itself. You need something durable that is either already colored or easily dyed to look like sails. I found curtain backing fits the bill. Curtain backing is cheap because it is designed to support fancy curtain material. A small amount of material will last forever. Giving your masts that tapered look adds a lot to its visual appeal and accuracy. Skipping this step will save a lot of time but I think the looks are worth it. Insert a wooden dowel into the mouth (the Chuck) of your cordless electric drill. For single end tapers install a slightly longer dowel into the chuck. It will leave marks you can cut off later. For double ended tapers you will need the actual sized dowel inserted with packing to prevent the chuck from marring the surface. The wood must be more firm that balsa so I used Popsicle sticks cut down. Some sanding may still be necessary. Once you have your wood work done assembly is straight forward. 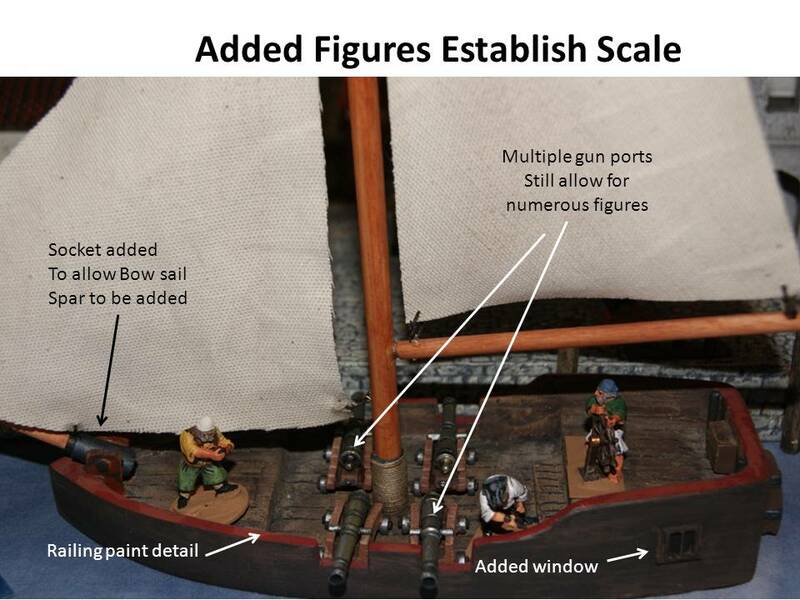 One advantage of the Foxhole Terrain casting procedure is that you get a flat thick deck to mount your sails. 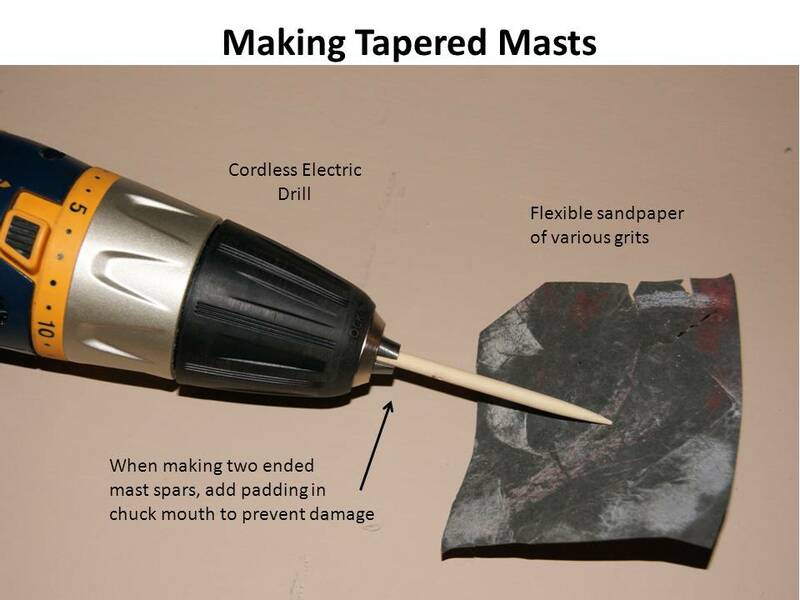 As mentioned in figure 1 you will have cut down a bullet casing (or brass tubing) to accept your completed mast. The casing has the advantage as it has a bottom with a lip. The lip can be mounted flush with the bottom and the mast will not drop through if smaller in diameter that the tube. Wrap any exposed metal in ship rigging twine and paint with Fray Check. I always cut my mast dowel slightly longer than I actually need. You can always sand or cut down later. I stain the naked dowel with diluted paint. In this case I used a wood brown color. Notice the difference between unstained and stained wood in figure 5. To get the multi-level mast effect make two mast braces, paint and install. 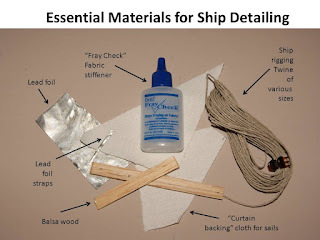 Tack with glue and then wrap twine and paint again with your Fray Check. Install this portion before installing the cross frames at the bottom of the sail. When dry lay the bare frame over plain paper (or for our high-risk takers, over the cloth, and draw slightly over sized sails. Cut them out with an extra sharp scalpel and Tie them onto the masts. You can use previously installed mast eyes or just drill a hole through the mast and pull the thread through. 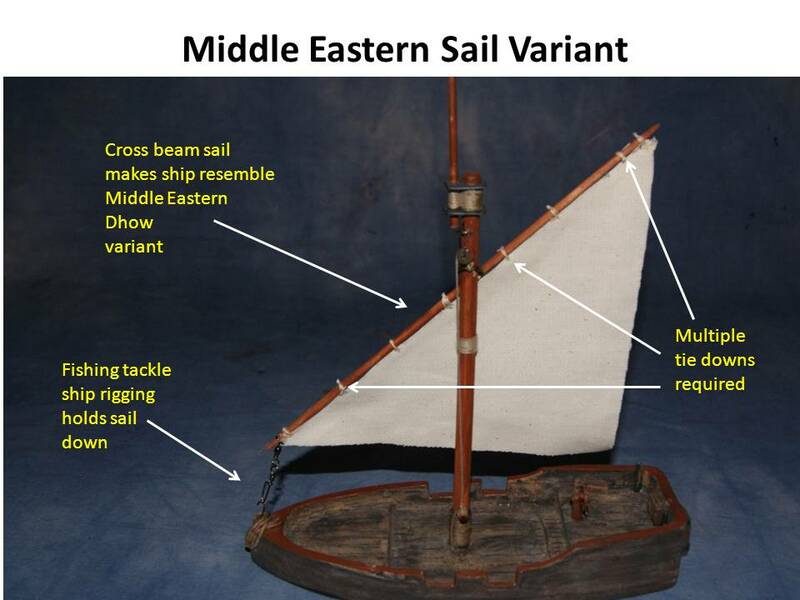 The Middle Eastern Dhow Variant in Figure six shows another version of the sail tie down procedure. It also illustrates how the small scale fishing tackle can be installed into the well-built walls of the Fox Hole Terrain casting. 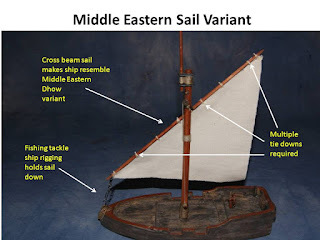 This version requires extra hardware due to the weight of the sail. It has a tendency to fall backward unless secured. I found it a pleasant surprise that the Foxhole Terrain ship’s basic shape fit well with all three variants I built. Nothing separates the trash from the treasures like putting a model on the table top. 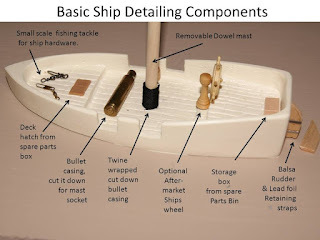 I have used these ships in a variety of games and they have been handled, dropped, admired and sloshed around in the trunk of the car without damage. I will say, I do remove the masts when the game starts, but they are designed to take real world use. Figure 7 illustrates how well suited their 4 gun ship takes a full sale in this cutter version. There is ample room for figures and ordinance. I installed 12 pounders for the photographs however I normally use 6 pounders to make room for more crew. Figure 8 displays the table-top visual experience to its full effect. The three ships illustrated are l functionally the same vessel which shows how altering the paint scheme and sail configuration can take your game-top visuals to another level. The three ship variants shown are only a small sample of the possibilities. I tend to make my sail configurations flat for storage, they create a small fingerprint on the gaming table, and they need far less rigging and tie downs than cross sails. The busy dock scene with accompanying port buildings begins to illustrate how well the Foxhole Terrain ships compliment a variety of other manufacturer’s buildings and scratch-built features. Yes I built the docks, but that is another article. You may also notice that once the gaming action occurs around the boats I remove the sails. Similarly I also remove the tops to my buildings when troops move inside. Actually I had a blast working with these, very well made and utilitarian vessels. I’ve received numerous positive comments on them and been awarded several “Best Gaming” awards at HMGS South Conventions. They are an excellent value at the MSRP of $22.00.